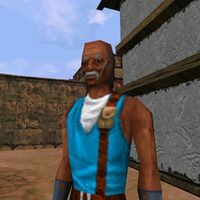 Trithik is a local Redguard sailor usually found at the docks, who strongly opposes the Empire's occupation of Stros M'Kai. He sometimes walks down to his boat next to Brennan's ship or up toward the center of town, stopping at the Bell Tower. His house in the Old Quarter burned down when the Crowns made their last stand there. During the quest A Legendary Flask, Trithik tells you about a map piece he lost. This piece turns out to be the one Crendal was bragging about in the Draggin Tale. You can trick him into revealing details about the theft, which you may report to Trithik. The old sailor expresses his low regard for Crendal, then describes what was on the map piece (two numbers, an X, and the notation 'long tree') and tells you to keep it if you find it. You must use Trithik's description to convince Crendal to check his hiding spot. A Legendary Flask: Put together a map to find an ancient flask that absorbs magic. His name is often spelled "Trithick" in the game files. The topics "Iszara" and "War" are supposed to disappear after the quest Rescue Iszara, but the variable that implements this is never set. "Don't practice here, lad. Take a walk outside town where you won't threaten the townsfolk." "Get 'em, lad! Make us proud!" "Flash-quick, Redguard! They'll not handle you!" "Hello, my name is Cyrus." "And mine is Trithik, lad." "Trithik? May I bother you again?" "Change you back! Hunding'll have you changed to stone if you don't make haste to the cold dark!" "Stone your hide, dark foul thing of the underneath!" "Babble to the righteous, thou offal-ken!" "I'm looking for my sister, Iszara. Perhaps you've seen her?" "I do not know the name, but so many have been lost since the dragon arrived." "She went missing three months ago." "If she was with the Crowns, I would count her among the casualties. Richton's slaughter was elegant only in its thoroughness." "The ship that brought me here was beset upon by some rascals called the Restless League. What do you know of them?" "Fearless men, whose names are all too often breathed in hate." "Don't believe them too wrong, for even the Prince had their ear." "It seems quiet here, especially for a port-city. How fares Stros M'Kai under Imperial rule?" "Defeat is read in every native face, my boy. The war cost the city much, including its voice. "The Crowns are no more, as kingless as Yokuda, lost now to song which no one will sing, lest Richton hear. Overmuch, the Governor is the reason Stros M'Kai is so quiet." "I have not heard mention of Yokuda since my childhood." "The first land. Where the Redguards came from, in blessed Hunding's day." "I saw the Statue of Hunding on my way into port. I'm surprised Richton hasn't levelled it yet." "He cannot, or will not, for it keeps the goblins out of Stros M'Kai, out and under it. Such is Frandar Hunding's grace that he blinds them still." Trithik says any goblins in Stros M'kai are banished beneath the earth of Stros M'kai, thanks to Frandar Hunding. "There are goblins under Stros M'Kai?" "And worse, but you needn't worry about them. They are doomed to the dirt and bother the Redguard no more." According to Trithik, though Prince A'tor's body was lost at sea, there are already prophecies of his return. "What did the Imperials do to the Prince?" "A'tor was slain at sea, and there his body was lost, thankfully. Already the obligatory prophecy of his return has begun, spoken in hush, an ill surrogate for true hope this season. "The Redguard should know better, be blind to desperate omen. Thassad's son has left us, wind-swift and sadly, never to return." From Trithik I learned that Prince A'tor had dealings with the Restless League, though the Crowns considered the League untrustworthy. "So A'tor had dealings with the Restless League, then?" "Never openly, for then even the Crowns thought the League untrustworthy. Now they are Hammerfell's last hope. "A'tor's death sent them into hiding, and dragonfire keeps them there." "How can you be thankful that Prince A'tor's body was lost at sea?" "Insofar that the seabed may claim him before the necromancer does, that is all. That his soul may rest easy from the snare surround." "Tell me about the necromancer." "A westward evil, aseat in the ash-grey shoals. On parade now that the Empire's here, lad, so don't die." "What is the 'snare surround'?" "The necromancer's curse, writhing in the near-here, only a death away. Its magic snatches at your soul should you perish, to fuel some darker deed still." A necromancer's curse affects Stros M'kai. According to Trithik, the shoals when [sic] the necromancer is found lie to the west along a path over a bridge. "How far west are the shoals?" "Not a day's journey. Just follow the path over the bridge." "Should I fear death more than normal, then?" "The snare waits for those who don't." "This dragon -- an Imperial metaphor, perhaps...?" "Banner and bone, young Redguard. Seek the Old Quarter if you want to see the handiwork of both." "I fear that my sister's disappearance had something to [sic] with the civil war... ."
"I read more than fear in your face, Redguard, either retribution or redemption. Alas, sometimes they are the same. Neither can come without wounds." "I said nothing about redemption or --"
"Why else would you be here, in this narrative? In you--"
"How can the two be the same?" "In their concern for blood, in blood as closure. I assure you, it will be spilt before you find your sister. A prayer may do you well." "At the temple of Blessed Arkay. Brother Nidal presides there, and he knew most of the people in town. He may know something about your sister." "In the town square, shoreside from the pool." When I suggested speaking with Richton, Trithik said that no Redguards are admitted to the palace. "Perhaps I should speak to this Richton, then." "Spoken true, my boy, but I'd advise against it. The Imperials suffer no Redguards in the Palace, unless you're Forebear, and you walk on too few legs to be that." "What do the Imperials plan to do here?" "Confusion often follows conquering, but if Septim does have a plan for Hammerfell it hasn't been made clear. "I suspect a greater plan than constant terror, for Richton has men all about the island, not just here in Stros M'Kai." "So I can't get into the Palace, then?" "Not unless you can produce something that Richton will desire." "Has Tiber Septim made the Crowns suffer much for their resistance?" "Through his agents, yes, but I fear that the Provisional Governor is an especially wicked feast to swallow. "The blood has slowed to a trickle, if only for lack of targets, and the Crowns who survive still remain silent." "Can a Redguard not even admit his allegiance to the Crowns openly?" "I can't speak for the rest of Hammerfell but such an admission here is martyrdom at best. A persecution of silence reigns in Stros M'Kai." "Tell me of the Forebears." "Throne-defilers, all. Hosts to the invader, and Hunding's shame." Trithik says that Governor Richton ordered the destruction of the Old Quarter, a refuge of the Crowns, with dragonfire. "What happened to the Old Quarter?" "It was the last stand of the loyalist Crowns, and Governor Richton had it destroyed. It smolders still, all ash and dragonfire. Few escaped the incident." "I have heard tales of a magical flask buried somewhere on Stros M'Kai." "The legend older than the Redguard. Many have looked and failed, but who can resist the lure of lost treasure? "In my youth, I, too, searched for the flask. Luckier than most, for I once possessed a piece of the truth." "The flask is in pieces?" "No, my boy, a piece of a map, purported to show its location. I say a piece of the truth, but that is only an old man talking, for the map may lead to nothing, even if it was entire." Trithik says he used to have a piece of a map to the Flask of Lillandril, but that it was stolen several weeks ago. "Perhaps, but it sounds like a worthy challenge. Do you still have the map?" "No. 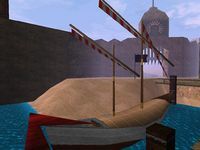 Since my house in the Old Quarter was destroyed, I've stayed in my boat. "I risked my life to save that map, and was justly rewarded for my unworthy obsession when it was stolen a few weeks ago. I'm glad it's gone." "Why unworthy? A map to a priceless magical artifact seems like a worthy prize." "And so the Redguards have fallen. The elders teach the young and who can blame them for learning? The true Redguard risks his life for honor, pride and spirit." "Ideology doesn't mark the spot, old man." "As much as a lost map it does, mercenary. I saw but fit to warn you against searching for the flask's wealth for its own sake. The world is bigger than your gold pouch." "Yeah, yeah. 'A sword sold is a sword sullied against true cause.' Nevermind why I want the flask, Trithik." Trithik can only remember that his piece of the map to the Flask of Lillandril bore two numbers, an 'X', and the notation 'long tree'. "A fellow named Crendal was bragging about a map he stole from you. Was he lying?" "Crendal, eh? Belly-crawling son of a Forebear's cur! It was part of a map supposedly showing the location of the Flask of Lillandril. "In my youth I was something of a treasure-hunter." "Do you remember what was on the map?" "Two numbers, an X, and the notation 'long tree', that's all I can remember. If you find it, keep it. I'm too old for such things." "Maybe I can get Crendal to find it for me. Thanks for your help, Trithik." "I seem to have found your thief. Crendal let slip that he has your map piece." "Did he now? I should have known. Lower even than a Forebear, that one." "Perhaps I can get it back. What was on the map?" "Lakene said your boat was damaged by vandals?" "By the looks of it. Woke up one morning and the mid board was broken. Hope he gets to it soon." "Thanks. Trithik. I've got to go." This page was last modified on 15 August 2018, at 06:54.